My husband's friend regularly gives us fresh fish that he catches. When he does, I like to try new recipes and this one is one that I have repeated quite a few times as we really love it. It is very simple to make, which I love. The coconut rice I make in a rice cooker, can't get easier than that. And can be made in advance and kept in the warm mode. Now this recipe is for a 750g fish. 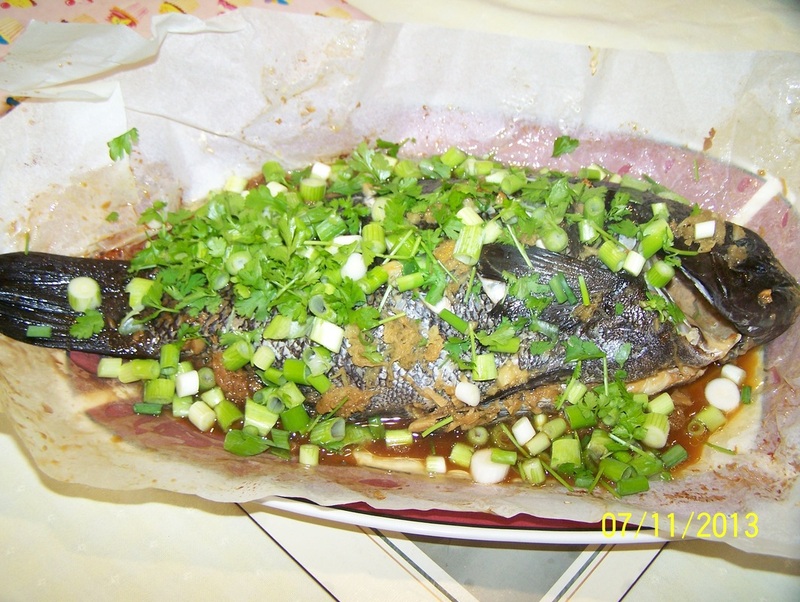 I will write the recipe for the 750g sized fish just remember a fish twice the size does not need twice the cooking time, a fish twice the size should only need 10-15 minutes more cooking time. If you are cooking fish for the first time, check the fish after 30 minutes, if it flakes away from the bone at the thickest part of the fish easily it is done, if it won't come off the bone continue cooking the fish until it does. My whole family loves this, give it a try, it really is lovely. Preheat the oven to 220C. Line a baking tray with aluminium foil, then with non stick baking paper. Place all of the ingredients in a rice cooker, cook. Once cooked stir, discard ginger, keep on warm mode until required. Alternate method: Place all ingredients in a large saucepan over high heat. Bring to the boil, stirring occasionally. Reduce heat to low. Simmer, covered, for 10 minutes. Remove from heat. Stand, covered, for 10 minutes. Discard ginger. Serve. Wash the snapper under cold running water. Pat dry with paper towel inside and out. Cut 3 slashes, about 1cm deep, into the thickest part of snapper on both sides. Place in the lined pan. Spread garlic and ginger over the snapper. Combine soy sauce, chicken stock, dry sherry and sesame oil in a jug. Pour over the snapper. Cover the pan tightly with foil. Bake for 30 minutes or until snapper flakes easily when tested with a fork. Transfer to a warmed heatproof platter, reserving juices. Heat peanut oil in saucepan over medium heat until just smoking. Pour over snapper. Pour over the reserved juices. Top with shallot and coriander to serve. Serve with coconut rice.